Another exciting season of college football is set to kick off this weekend, so it’s an ideal time to revisit the sports pages of yesteryear on Chronicling America. With the University of Oregon Ducks preparing to defend their Pac-10 Conference title–and the Beavers of Oregon State once again looking like a formidable challenger for the Roses–we turn all the way back to the year 1917. This was the year that an Oregon team made its first January trip to Pasadena for the postseason game that would later come to be branded as the “Rose Bowl.” In those days, the team from the East was always regarded as a prohibitive favorite. Such was the case when UO faced off against the University of Pennsylvania. 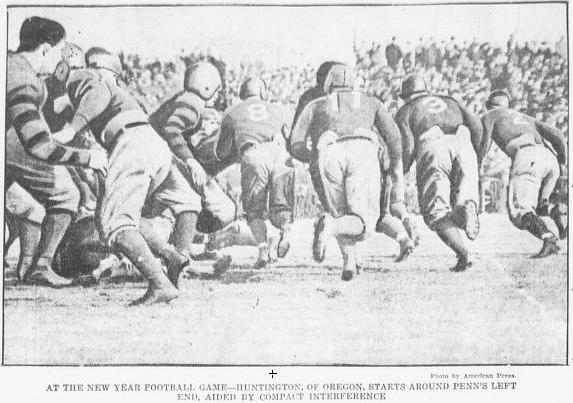 1917 "Rose Bowl", from the Philadelphia (PA) Evening Public Ledger, January 2, 1917. Night Extra, page 16. It is an interesting exercise to compare coverage of the game from journals on the opposite coasts. In its January 2nd recap, the Klamath Falls Evening Herald sticks mostly to a blow-by-blow account of the action on the field. The post-game article in the Evening Public Ledger of Philadelphia, Pennsylvania focuses rather more on analysis and excuses for the game’s unexpected outcome. Published a week later, Penn team captain Neil Mathews’ reflection demonstrates good sportsmanship as the author attempts to balance the two perspectives on the big game. Circa 1917, Oregon’s uniform colors were “blue and lemon yellow.” Green came later, apparently. The 25,000-30,000 in attendance were, at this time, the largest audience ever for a game on the West Coast. This contest, along with Cal’s defeat of Brown University in the previous year’s game, was instrumental in earning respect for college athletics in the West. The assumption had been that Eastern and Midwestern teams were inherently superior in both talent and tactics.